The Anabaptists were a group of Swiss, German, and Dutch reformers starting in the early 1500s. Some Anabaptists were followers of Menno Simons (1496–1561) who was an Anabaptist reformer from Friesland (today a province of The Netherlands). His followers were called Mennonites. Mennonites rejected infant baptism, violence toward others, and stressed the separation of church and state. During the Spanish rule of the Netherlands, Mennonites like other reformers were severely persecuted by the inquisition. Some Mennonites went west while others went east. Those who escaped persecution by immigrating to North America, helped to found Germantown in the English colony of Pennsylvania in the 1680s. The Pennsylvania Mennonites became what are now known as the Pennsylvania Dutch. Those who went east, immigrated to the delta of the Vistula River in Prussia/Poland, south and east of the city of Danzig in the late 1500s and early 1600s. The Vistula delta has lowlands below sea level, very much like the Netherlands and the Mennonite’s skill in building wind water pumps and dike management was in demand. In 1772 Frederick II (the Great of Prussia) annexed north Poland, creating east and west Prussia. Mennonites worried that their sons would be conscripted into the Prussian army. Also, a growing Mennonite population made land scarce on the reservations Mennonites were alloted. In 1788 the Prussian Mennonites emigrated to New South Russia (later eastern Ukraine) as part of a program by Czarina Katherine II (the Great of Russia) (reign: 1762-1796) to introduce north central Europeans, to lands then recently taken from the Turks/Cossacks. The original Mennonite immigration to Russia took place from 1788 to 1802. In 1788 a first group of 228 Mennonite families left East Prussia for Russia. They were soon followed by another group of 234 families for a total of 462 original colonists. The first Mennonite settlement in Russia was called Chortitza. Chortitza was founded in 1789. Later, more villages were built in new settlements, the Molotschna, and Bergthal to name two. The Russian government located the Mennonites in an area then called New Russia or South Russia, that had been occupied by unruly Zaporozh'ye Cossacks who's loyalties were often with the Turks. 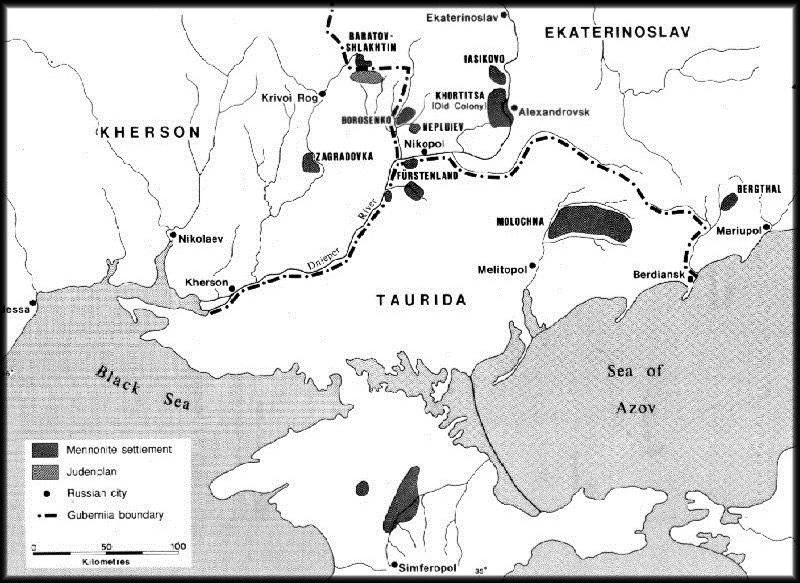 The area assigned to Mennonites was near the modern city of Zaporozh'ye, in an area called Chortitza on the Dnieper River, in what is now south central Ukraine. At the same time the Zaporozh'ye Cossacks were displaced. The Cossacks never forgot this and when the last of the Romanovs was overthrown in 1917, they exacted terrible revenge on those Mennonites still living in the region. Czarina Katherine II and later her son, Czar Paul I, gave the Mennonites a charter that granted them certain liberties, especially that they could be semi-self governing, have their own schools, and practice their own religion including exemption from military service and certain taxes. and wood lots. They started industries that ranged from clock making to heavy farm equipment. They built hospitals, and schools and orphanages.